In this edition of The Write-Up, Chaz Fiorino provides a detailed scouting look at Brandon Workman. Stat line: 6.2 IP, 3 H, 1 ER, 2 BB, 6 K, 108-68 Pitches-Strikes. 14/25 first pitch strikes. 8 swing-and-misses. Physical Description: Tall, strong-framed, mature body. Filled out throughout. Maxed out physically. Arm/Delivery Mechanics: High three-quarters to overhand arm slot. No windup, stands square to the plate on rubber. Hands set at the belt. Slight bounce in step with back leg as he pivots in front of rubber in delivery. Brings arms up to head level with high leg kick. Short arm action in back. Definite effort in delivery but was able to stay online and repeat throughout. Comments: Most 87-89. T91. Fairly straight. Pitched effectively on inner half with consistency. Elevated with two strikes. Was not afraid to challenge hitters. Average to above-average command and control. Pitch could play slightly above-average out of the bullpen, where he is best suited. Comments: Short, late, horizontal cut. Average command and control. Comments: 12-to-6 with sharp break when he gets on top. Showed plus control starting it up in zone and finishing down out of zone. Fringe-average command and struggled to command in zone and to get hitters to chase. I have seen him command better in the past, which allowed the pitch to play above-average. Comments: Threw with solid arm speed and showed arm-side sink. Threw with confidence and was able to steal a few strikes to start at-bats. Average command and control. Summation: Workman impressed with his ability to consistently pitch inside and establish the inner part of the plate. This opened the outer half of the plate and allowed Workman to throw the cutter off the outside part of the plate just off the barrel of right-handed hitters. He was not afraid to elevate the fastball by design with two strikes, and he had success doing so to pick up a few swing-and-misses. Threw a heavy dose of curveballs and consistently buried the pitch out of the zone, but he failed to locate within the zone and get any hitters to chase. I have seen better outings, during which he was able to command the curveball in the zone, allowing the pitch to play above-average with 12-to-6 overhand break. The change-up was an effective fourth offering and allowed Workman to keep hitters guessing and steal a few strikes early in the count. 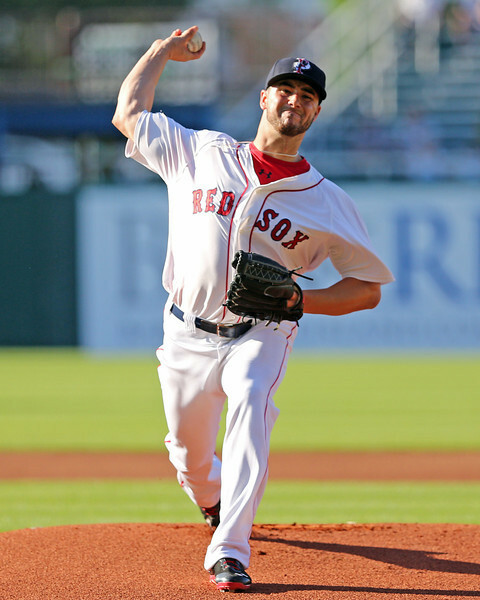 Overall, I see Workman’s future best suited as a highly successful eighth-inning arm out of the bullpen. In the short term, he can be a great depth starter who can eat innings at the back end of a rotation and keep you in a ball game. Given the effort in his delivery and his overall stuff, Workman would probably have a hard time giving you 180-plus quality innings out of the rotation. His best chance to stick with success is in relief, where his fastball can play up in the 92-95 mph range and he can still successfully maintain his control and command as we have seen in the past.